For other uses, see Ouroboros (disambiguation). The Ouroboros or uroborus (/ˌ(j)ʊərəˈbɒrəs, uːˈrɒbərɒs/) is an ancient symbol depicting a serpent or dragon eating its own tail. Originating in ancient Egyptian iconography, the ouroboros entered western tradition via Greek magical tradition and was adopted as a symbol in Gnosticism and Hermeticism and most notably in alchemy. The term derives from Ancient Greek: οὐροβόρος, from οὐρά (oura), "tail" + βορά (bora), "food", from βιβρώσκω (bibrōskō), "I eat". The first known appearance of the ouroboros motif is in the Enigmatic Book of the Netherworld, an ancient Egyptian funerary text in KV62, the tomb of Tutankhamun, in the 14th century BC. The text concerns the actions of the god Ra and his union with Osiris in the underworld. The ouroboros is depicted twice on the figure: holding their tails in their mouths, one encircling the head and upper chest, the other surrounding the feet of a large figure, which may represent the unified Ra-Osiris (Osiris born again as Ra). Both serpents are manifestations of the deity Mehen, who in other funerary texts protects Ra in his underworld journey. The whole divine figure represents the beginning and the end of time. The ouroboros appears elsewhere in Egyptian sources, where, like many Egyptian serpent deities, it represents the formless disorder that surrounds the orderly world and is involved in that world's periodic renewal. The symbol persisted in Egypt into Roman times, when it frequently appeared on magical talismans, sometimes in combination with other magical emblems. The 4th-century AD Latin commentator Servius was aware of the Egyptian use of the symbol, noting that the image of a snake biting its tail represents the cyclical nature of the year. 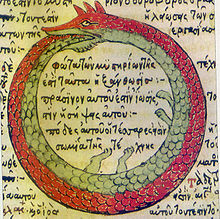 The famous ouroboros drawing from the early alchemical text, The Chrysopoeia of Cleopatra (Κλεοπάτρης χρυσοποιία), probably originally dating to third century Alexandria but first known in a tenth century copy, encloses the words hen to pan (ἓν τὸ πᾶν), "the all is one". Its black and white halves may perhaps represent the Gnostic duality of existence, leading some to see it as an analog of the Taoist yin and yang symbol. The chrysopoeia ouroboros of Cleopatra the Alchemist is one of the oldest images of the ouroboros to be linked with the legendary opus of the alchemists, the philosopher's stone. In Gnosticism, a serpent biting its tail symbolized eternity and the soul of the world. The Gnostic Pistis Sophia (c. 400 AD) describes the ouroboros as a twelve-part dragon surrounding the world with his tail in his mouth. A 15th-Century alchemical manuscript, The Aurora Consurgens, features the ouroboros, where it is used amongst symbols of the sun, moon, and mercury. Engraving of an ouroboros by Lucas Jennis, in the 1625 alchemical tract De Lapide Philosophico. The figure serves as a symbol for mercury. An engraving of a woman holding an ouroboros in Michael Ranft's 1734 treatise on vampirrs. In Norse mythology, the ouroboros appears as the serpent Jörmungandr, one of the three children of Loki and Angrboda, which grew so large that it could encircle the world and grasp its tail in its teeth. In the legends of Ragnar Lodbrok, such as Ragnarssona þáttr, the Geatish king Herraud gives a small lindworm as a gift to his daughter Þóra Town-Hart after which it grows into a large serpent which encircles the girl's bower and bites itself in the tail. The serpent is slain by Ragnar Lodbrok who marries Þóra. Ragnar later has a son with another woman named Kráka and this son is born with the image of a white snake in one eye. This snake encircled the iris and bit itself in the tail, and the son was named Sigurd Snake-in-the-Eye. In the Aitareya Brahmana, a Vedic text of the early 1st millennium BCE, the nature of the Vedic rituals is compared to "a snake biting its own tail." Ouroboros symbolism has been used to describe the Kundalini. According to the medieval Yoga-kundalini Upanishad, "The divine power, Kundalini, shines like the stem of a young lotus; like a snake, coiled round upon herself she holds her tail in her mouth and lies resting half asleep as the base of the body" (1.82). Storl (2004) also refers to the ouroboros image in reference to the "cycle of samsara". The alchemists, who in their own way knew more about the nature of the individuation process than we moderns do, expressed this paradox through the symbol of the Ouroboros, the snake that eats its own tail. The Ouroboros has been said to have a meaning of infinity or wholeness. In the age-old image of the Ouroboros lies the thought of devouring oneself and turning oneself into a circulatory process, for it was clear to the more astute alchemists that the prima materia of the art was man himself. The Ouroboros is a dramatic symbol for the integration and assimilation of the opposite, i.e. of the shadow. This 'feed-back' process is at the same time a symbol of immortality, since it is said of the Ouroboros that he slays himself and brings himself to life, fertilizes himself and gives birth to himself. He symbolizes the One, who proceeds from the clash of opposites, and he therefore constitutes the secret of the prima materia which ... unquestionably stems from man's unconscious. The Jungian psychologist Erich Neumann writes of it as a representation of the pre-ego "dawn state", depicting the undifferentiated infancy experience of both mankind and the individual child. The genus of the armadillo girdled lizard, Ouroborus cataphractus, takes its name from the animal's defensive posture: curling into a ball and holding its own tail in its mouth. ^ "uroboros". Oxford Dictionaries. Oxford University Press. Retrieved 25 August 2018. ^ "Definition of 'ouroboros'". Collins English Dictionary. Retrieved 25 August 2018. ^ Hornung, Erik. Conceptions of God in Egypt: The One and the Many. Cornell University Press, 1982. pp. 163–64. ^ Hornung 2002, p. 58. ^ Servius, note to Aeneid 5.85: "according to the Egyptians, before the invention of the alphabet the year was symbolized by a picture, a serpent biting its own tail, because it recurs on itself" (annus secundum Aegyptios indicabatur ante inventas litteras picto dracone caudam suam mordente, quia in se recurrit), as cited by Danuta Shanzer, A Philosophical and Literary Commentary on Martianus Capella's De Nuptiis Philologiae et Mercurii Book 1 (University of California Press, 1986), p. 159. ^ Origen, Contra Celsum 6.25. ^ Hornung 2002, p. 76. ^ Lambsprinck: De Lapide Philosophico. E Germanico versu Latine redditus, per Nicolaum Barnaudum Delphinatem .... Sumptibus LUCAE JENNISSI, Frankfurt 1625, p. 17. ^ Jurich, Marilyn (1998). Scheherazade's Sisters: Trickster Heroines and Their Stories in World Literature. Greenwood Publishing Group. ISBN 9780313297243. ^ "When Shakti is united with Shiva, she is a radiant, gentle goddess; but when she is separated from him, she turns into a terrible, destructive fury. She is the endless Ouroboros, the dragon biting its own tail, symbolizing the cycle of samsara." Storl, Wolf-Dieter (2004). Shiva: The Wild God of Power and Ecstasy. Inner Traditions / Bear & Co. p. 219. ISBN 978-1-59477-780-6. ^ Neumann, Erich. (1995). The Origins and History of Consciousness. Bollington series XLII: Princeton University Press. Originally published in German in 1949. Hornung, Erik (2002). The Secret Lore of Egypt: Its Impact on the West. Cornell University Press.